Extreme Motor Sales in Apopka FL offers 50cc -600cc motorcycles. 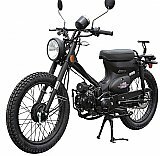 If you are a beginner we offer fully automatic motorcycles from a 50cc-200cc. We offer sport bikes, choppers and bobbers style motorcycles. CHEAP MOTORCYCLES FOR SALE at Extreme Motor Sales! Hit the streets on two wheels without taking a big hit to your wallet. Our cheap sport bikes offer the very best in performance, handling and power at a fraction of the cost.